Kanshudo includes a sophisticated system to help you practice writing Japanese. Drawing kanji and kana is a great way to cement them in your memory, and should be a key part of your Japanese study program. Use the links here to practice drawing hiragana, katakana and the most commonly used kanji components. You can also practice drawing any kanji or kana in the Kanshudo system from its details page (example: 本), or the quick view you'll see if you click on a character's blue box in kanji search results (example search: 日本語). For more information, see the Kanshudo complete guide to writing Japanese. Hiragana Perfect your hiragana expertise. Our hiragana drawing practice system lets you focus on specific characters, or work through the whole syllabary. 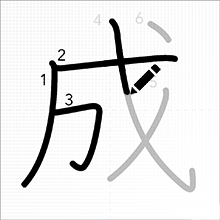 Read more about hiragana in our hiragana introduction, and create free Flashcards. To thoroughly study and test your hiragana knowledge, take the Kanshudo hiragana Challenge. Katakana Polish up your katakana skills. Our katakana drawing practice system lets you focus on specific characters, or work through the whole syllabary. Read more about katakana in our katakana introduction, and create free Flashcards. To thoroughly study and test your katakana knowledge, take the Kanshudo katakana Challenge. Components To really accelerate your kanji learning, you need to study the components that make up all kanji. Practice drawing the 50 most common components in Japanese. Read more about components in our components introduction, and review a list of the 50 most common components. For more advanced study, review lists of the 214 standard radicals, all components used in the Jōyō (daily use) kanji and if you're really ready for it, our comprehensive list of all components!